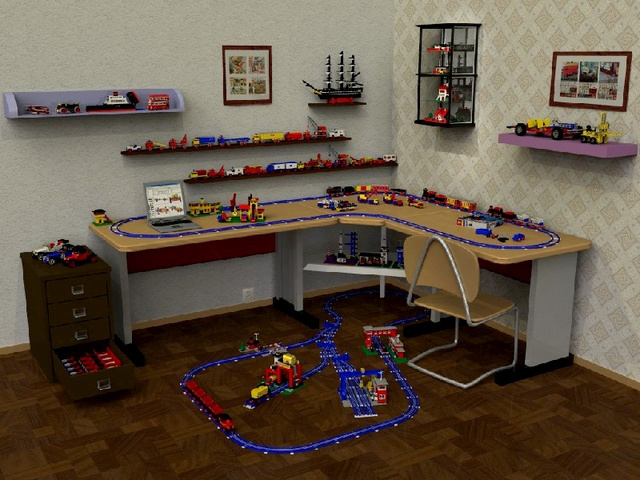 One of my side-interests (originally my main interest) in LEGO is CAD or virtual building using the LDraw system first created by the late James Jessiman. When you have a small collection of parts it is a great way to ‘build’ models that live up to your imagination rather than being limited to your supply. LDD provides one means of creating virtual LEGO models but if you take the time to learn it the older LDraw provides a much wider pallette of parts and more powerful tools than LDD. Best of all the two programs can share files with a bit of tweaking. I realised today that many TBB readers may not be familiar with LDraw so I thought I’d take a brief moment to promote it. Most discussions takes place on LUGNET but to make things more accessible I created a Facebook group and Flickr group too. Hopefully I’ll see some fresh faces at one of these places. The LDraw website (and organisation) organise regular challenges and contests too so be sure to check them out. Hm, the facebook link didn’t seem to work. Maybe you meant one of these two? Thanks for that. I’ve corrected it (hopefully) and added a reference to a flickr group too. Thanks for the flickr group, Tim. I downloaded Bricksmith a while ago, and it’s proving to be quite useful for working out Technic solutions. hooray for ldraw! I created a “virtual lego” group on flickr a few months ago but never got around to adding photos or inviting members, but now that there’s an official ldraw group, that’s much better. Hopefully with the new flickr group and posts like this on TBB, we’ll be seeing more entries in the POTM and SOTM contests – or at least enough to even have a contest – on ldraw.org too. I’d love more entries for the contests and challenges. It’s really interesting seeing what people can do. Thanks for posting this. Just what my wife wanted; me spending more time on my laptop at home. All my Legos are ancient (70’s and 80’s parts) so having access to new virtual parts will give me somewhat of a more modern creative outlet.